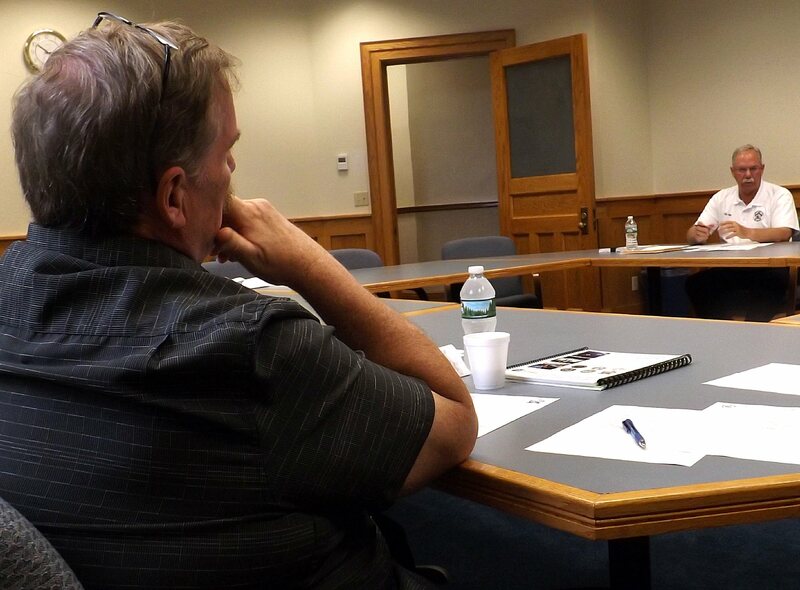 Legislator James Karasek, left, listens as County Fire Coordinator Don Forbes explains some of the issues regarding a fire district Wednesday. OSWEGO, NY – A sub-committee of the Oswego County Legislature is exploring the possibility of creating a county-wide fire district. There is no state law on the books that allow a county-wide fire district, committee chair Legislator Frank Castiglia said. Members of the County-wide Fire District Sub-Committee include legislators Jacob Mulcahey, James Karasek and Richard Kline. They met Wednesday to provide some updates and share information. He said he has contacted two counties in Florida and two in South Carolina with 15 to 20 questions regarding fire districts. “Our goal should be threefold. The safety of the firemen, safety of the residents and what we can do on cost savings,” he said. Oswego County Fire Coordinator Don Forbes said Chemung County did a study. It recommended some changes, but not consolidation. Also, if the county consolidates and eliminates some stations, creating areas where the response distance is greater than ISO’s five-mile radius “commercial and residential insurance rates are going to go up, commercial more than residential, Forbes cautioned. There are, maybe just three places in the county where they could consolidate and stay within ISO standards, he added. Manpower is the biggest issue facing volunteer department today, Forbes noted. Most towns and villages couldn’t afford to have a paid staff, he said. The issue of a county-wide fire district has been discussed, several times, by the county’s Fire Advisory Board, Forbes told the committee. Castiglia suggested that further discussion be placed on the agenda for the board’s next meeting and the committee members will attend to facilitate more dialogue. A lot of departments around the county use grant funds to help with purchases. However, a professional grant writer is needed to ensure that a grant application is even considered, Legislator Kline pointed out. And, due to the higher number of training hours, it is becoming more difficult to get people to join volunteer departments, Forbes added. Karasek said he was unsure what they could do in the face of state law. Forbes penciled in the group as an agenda item at the upcoming Fire Advisory Board to continue the discussion and gain more feedback. This is of no interest to people who are already well served by volunteers. We have no desire to subsidize the paid departments in Fulton and Oswego. The rising costs of their departments are their problems, not ours. No, no, no! Fulton always wants something for nothing. The police and fire depts budget along with retirement system contributions account for well over half, if not near 75% of Fulton’s annual budget. We see exactly how a city nose dives when you try to run on 25% of a paycheck. listen, I have made this suggestion more than once. get ahold of someone in the Los Angeles COUNTY Fire Department in Los Angeles, California and find out how to set up and run a county fire service. They have been doing it for several years and you might get some very good information. but you won’t know until you do it. How hard can it be? I have already talked to some Firechief’s from the Marion County Florida Fire and Rescue about how they formed a county wide Fire Dept. And they said you have to move very slow on the transition you have to make everyone feel involved.The one chief I talked to was a volunteer chief and then became a career chief of the Marion County Fire And Rescue.